Download "Module 1 : Conduction. 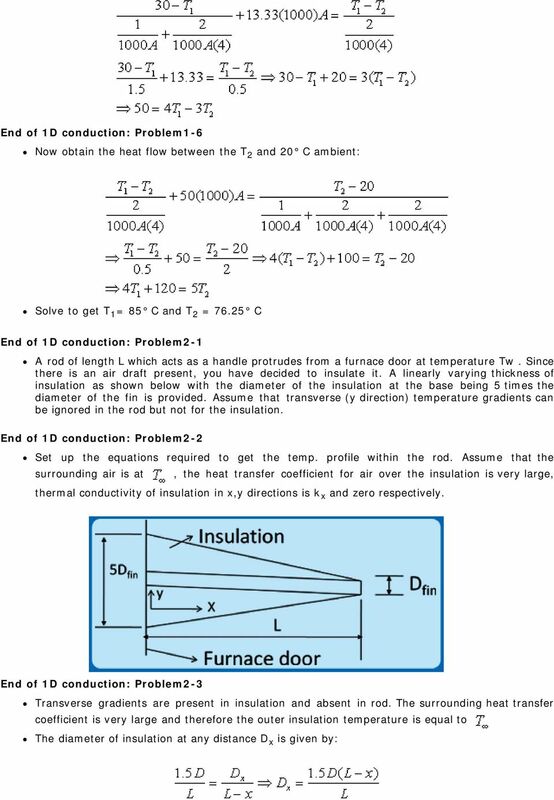 Lecture 5 : 1D conduction example problems. 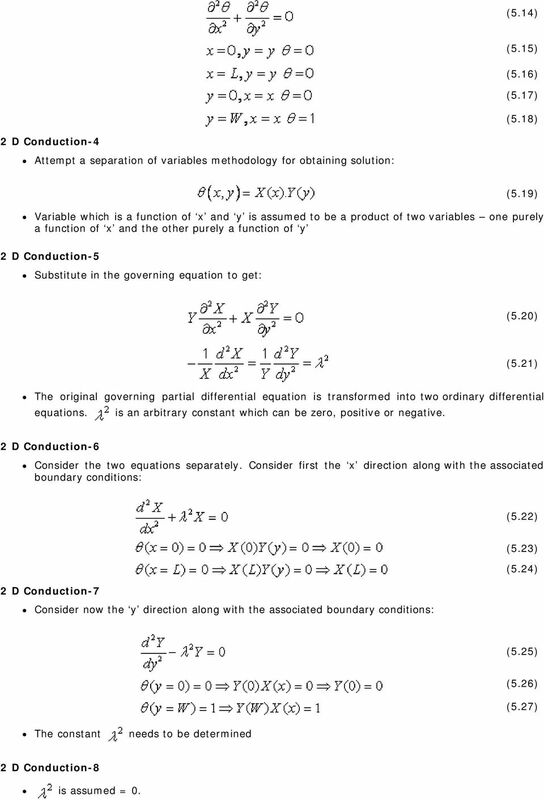 2D conduction"
6 (5.14) (5.15) (5.16) (5.17) (5.18) 2 D Conduction-4 Attempt a separation of variables methodology for obtaining solution: (5.19) Variable which is a function of x and y is assumed to be a product of two variables one purely a function of x and the other purely a function of y 2 D Conduction-5 Substitute in the governing equation to get: (5.20) (5.21) The original governing partial differential equation is transformed into two ordinary differential equations. is an arbitrary constant which can be zero, positive or negative. 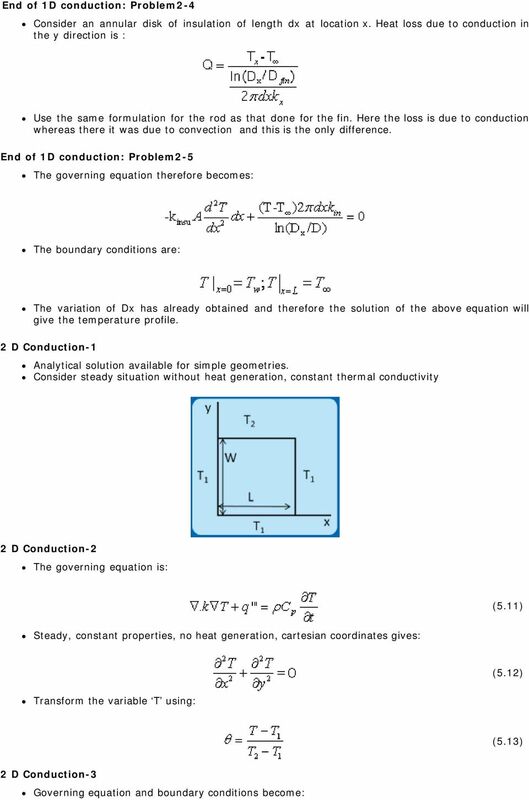 2 D Conduction-6 Consider the two equations separately. Consider first the x direction along with the associated boundary conditions: (5.22) (5.23) (5.24) 2 D Conduction-7 Consider now the y direction along with the associated boundary conditions: (5.25) (5.26) (5.27) The constant needs to be determined 2 D Conduction-8 is assumed = 0. 7 Solution for (5.22): (5.28) X = 0 is a solution which cannot be the case since we know x dependence exists. λ 2 therefore is not a valid option = 0 is 2 D Conduction-9 is assumed = ve. 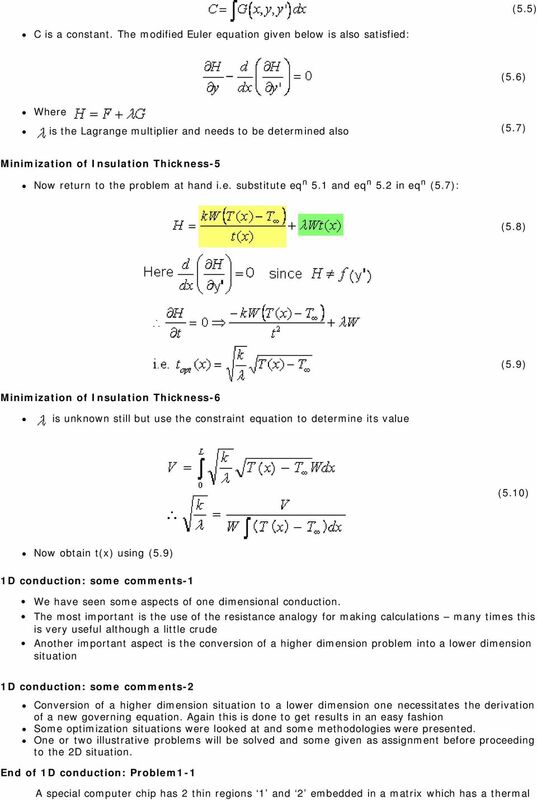 Solution for equ n (5.22): (5.29) This is not acceptable since this again implies no dependence on X Recap In this class: An example of optimization for insulation thickness is solved. 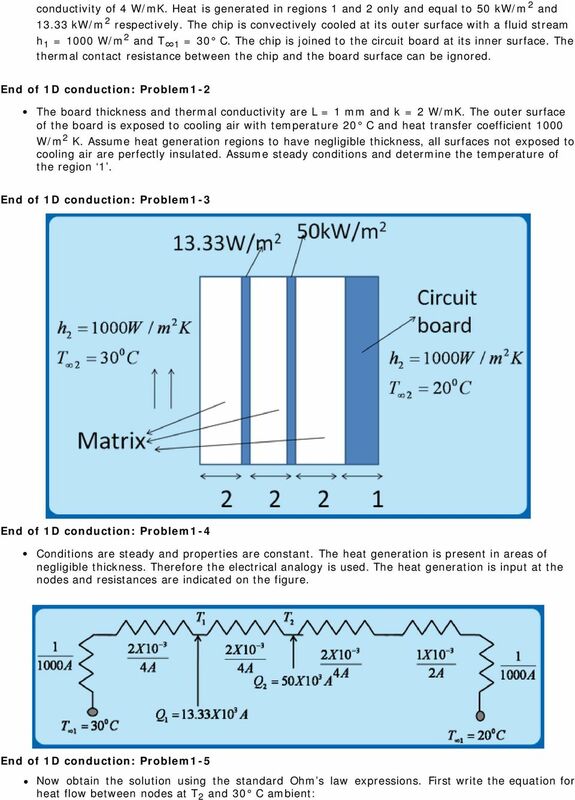 The 1D conduction is considered completed. 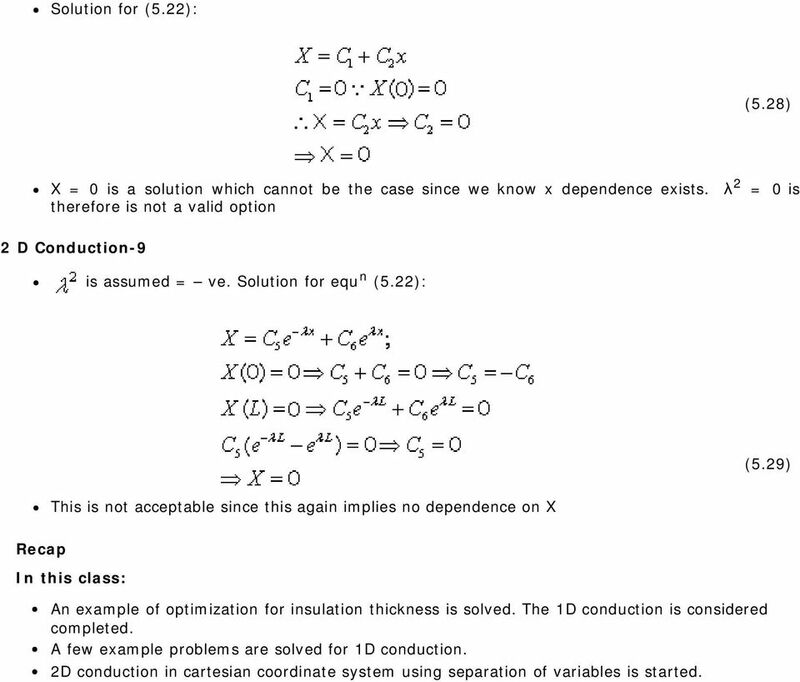 A few example problems are solved for 1D conduction. 2D conduction in cartesian coordinate system using separation of variables is started. What is Heat? Heat Transfer and Energy Heat is Energy in Transit. Recall the First law from Thermodynamics. U = Q - W What did we mean by all the terms? What is U? What is Q? What is W? 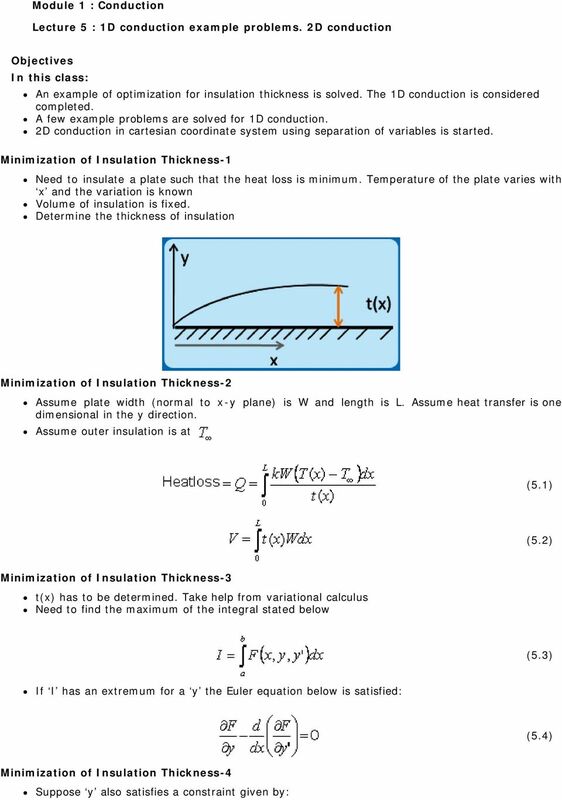 What is Heat Transfer? Effects of Cell Phone Radiation on the Head BEE 4530 Computer-Aided Engineering: Applications to Biomedical Processes Group 3 Angela Cai Youjin Cho Mytien Nguyen Praveen Polamraju Table of Contents I. The examination rubric is: Answer THREE questions, from FIVE offered. All questions carry equal weight. EXPERIMENTAL AND CFD ANALYSIS OF A SOLAR BASED COOKING UNIT I N T R O D U C T I O N Among the different energy end uses, energy for cooking is one of the basic and dominant end uses in developing countries. Autodesk Simulation Workshop Section 6: Heat Transfer The science of heat transfer enjoys a prominent role in engineering as is evident by its applicability across a broad range of processes and industries.